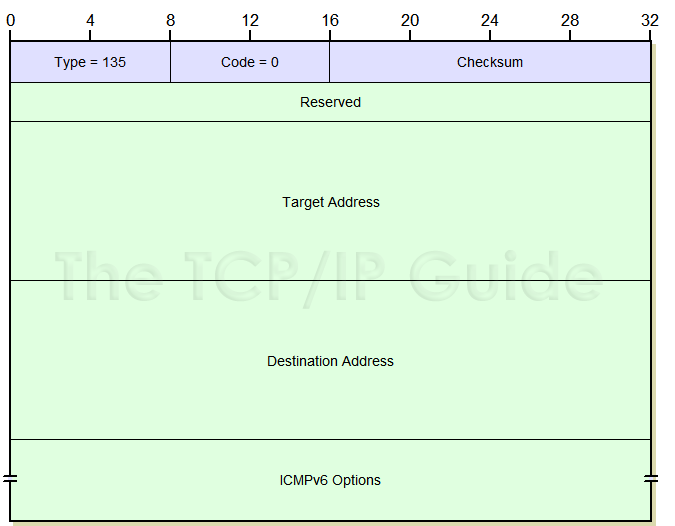 The format of ICMPv6 Redirect messages is shown in Table 113 and Figure 162. Type: Identifies the ICMPv6 message type; for Redirect messages the value is 137. Reserved: 4 bytes sent as zeroes. Target Address: The address of the router that the router creating the Redirect is telling the recipient of the Redirect to use as a first hop for future transmissions to the destination. Phew. Example time: if router R2 generated a Redirect telling host A that in the future transmissions to host B should be sent first to router R1, then R1's IPv6 address would be in this field. Destination Address: The address of the device whose future transmissions are being redirected; this is the destination of the datagram that originally led to the Redirect being generated. Repeating the example above: if router R2 generated a Redirect telling host A that in the future transmissions to host B should be sent first to router R1, then host B's IPv6 address would be in this field. [ Target Link-Layer Address: The layer-two address of the Target Address, if known. This saves the recipient of the Redirect message from needing to perform an address resolution on the target. [ Redirected Header: As much of the IPv6 datagram that spawned this Redirect as will fit without causing the size of the ICMPv6 error message (including its own IP header) to exceed the minimum IPv6 maximum transmission unit (MTU) of 1280 bytes. Note: As an aside, the Redirect message has always been somewhat of an oddball. In ICMPv4, it is considered an error message, but this makes it different from other error messages. For one thing, it's not really an error, since it doesn't represent a failure to deliver, only an inefficiency in doing so. For this reason, in ICMPv6 it was moved to the set of informational message types. Here too it doesn't really fit in with the others, since it is sent in reaction to a regular IP message, and it also includes a copy of (part of) the datagram that spawned it, like error messages do. Key Concept: ICMPv6 Redirect messages are used by a router to inform a host of a better router to use for future datagrams sent to a particular host or network. They are not used to alter routes between routers, however.